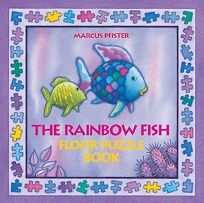 Marcus Pfister's Rainbow Fish keeps on swimming in the Rainbow Fish Floor Puzzle Book. The paper-over-board book boasts one large puzzle piece that pops out of each illustration. Underneath, the illustration is almost identical except for a small detail; a caption offers a hint (""The lantern on one of the lantern fish is missing,"" reads one). After readers remove all the pieces, they can assemble them into a single large puzzle.